Adam and I haven’t had the best wedding anniversary celebrations. We went to Azumi for our first anniversary and had a memorably bad experience. We spent our second anniversary in the hospital last year when Maya was sick. The bar was low this year for our third anniversary but I’m happy to report we had an amazing day in DC to celebrate. We dropped Maya at my in-laws and headed to the Georgetown waterfront where we parked our car for the day (only $13 in a garage). We started our day with brunch at Fiola Mare. After a couple of incredible meals at the original Fiola, we were very excited to try this location. We did the fixed price brunch – three courses + a brunch cocktail + fresh baked croissants. It was more food than necessary but so so good. I’m not sure what was up but the service was really slow. Like insanely slow – people were complaining (rightly so). But we had nowhere to be and just relaxed and enjoyed. I had a Bellini and burrata for my first course and Adam had a Bloody Mary and a smoked salmon dish. Then they brought out the croissants, warm, freshly baked with honey in the center. They were probably the best thing I put in my mouth all day and one of the best croissants I’ve ever had. For our main courses, Adam had the crab spaghetti and I had a succulent crab roll on brioche bread. I wouldn’t expect a restaurant like that to have outstanding baked goods but they do! By that point we were super full but managed to have a couple bites of dessert: zeppoli with a maple dipping sauce. After that enormous meal, we needed to walk it off! We strolled through the main drag of Georgetown before walking up 30th Street to Tudor Place. We paid $3 to tour the gardens of the historic home and spent some time walking around the property. Georgetown has so many hidden gems and it was fun to explore the beautiful grounds. From there we walked down Embassy Row to Dupont and visited the Phillips collection. We arrived at the museum thirty minutes before they closed and were delighted to learn that for the last half hour museum entry is free! We started on the top floor with the visiting Klee exhibit but preferred the impressionists on the second floor. They have some famous paintings (Renoir’s Luncheon of the Boating Party) and some beautiful paintings by Van Gogh, Matisse and Kandinsky. After plenty of walking and exploring, it was almost time to eat again! We walked through Dupont Circle, popped into Gap and then made our way to Iron Gate for dinner. I had a fantastic whiskey cocktail and we started with the feta chili spread with fennel crackers and an odd selection of crudités. For out main meal we shared the mixed grill: quail, bison steak, ground lamb, cheese burger and pork sausage with pistachios. The meats were accompanied by smashed potatoes and sweet potatoes with raisins. Everything was delicious and we loved our cozy table in the back room by the fireplace. After dinner we took a cab back to our car and made our way home after an exhausting but wonderful day in DC! Post-mani, I met Adam for dinner at Mother’s. 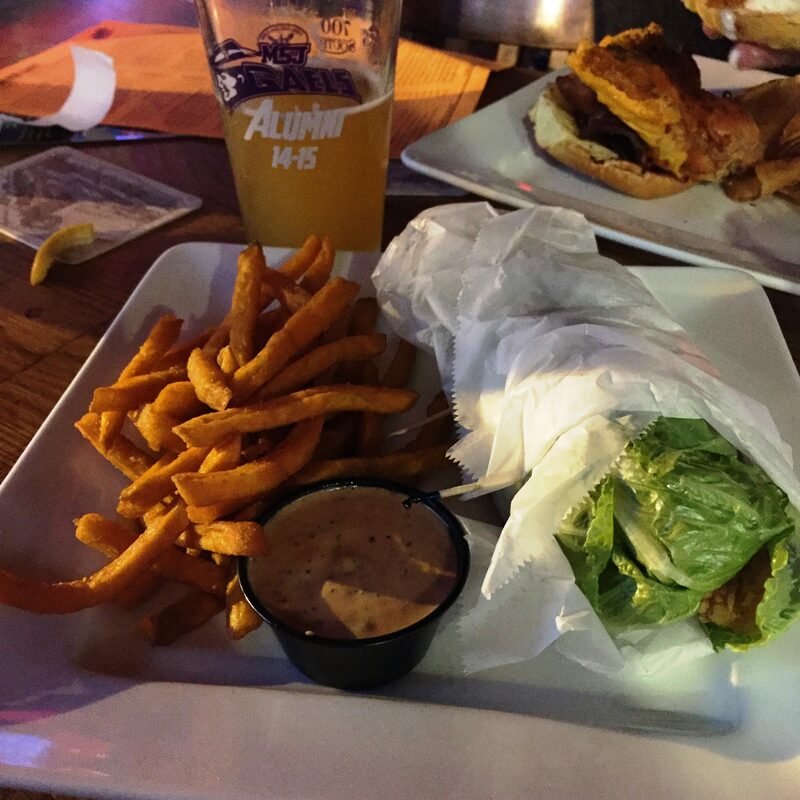 I had a shrimp lettuce wrap with sweet potato fries and Adam had a buff chick sammy. We had an early night and did a couple loads of laundry at home before heading to bed. Saturday morning I woke up early, refreshed and ready for the day! I picked up my mom and drove to DC to cheer on my friend Lindsay who was in town for the Avon Walk to end Breast Cancer. This was Lindsay’s 7th year participating in the event and she walked 39.9 miles over the weekend. Lindsay, her aunt and her dad have raised over $32,000 for breast cancer research and support services since they got involved with the race in 2010. My mom is a breast cancer survivor, so it is a cause near and dear to our hearts. We were excited to meet up with Lindsay around mile 9 and walk with her a little to show our support. Lindsay – you rock! If you would like to donate to Avon through Lindsay’s page click here. We gave Linz a hug and wished her luck for the next 30 miles(!) of her walk then my mom and I walked back to Teaism for lunch. Teaism is the best fast casual Asian inspired tea house and we’ve been going there since I was in high school. I got my usual chicken bento box and it was amazing as always. The fried chicken comes with an incredible sauce, brown rice, pickled cucumbers and sweet potatoes. My mom had the curry chicken which was also delicious and came with that ridiculous veggie skewer. Saturday night we had some friends over to watch the Caps game and ordered Maiwand Kabob. Sunday consisted of a super lazy morning, a trip to the gym and some Starbucks. Then Jeanette and I headed to Canton Crossing for some shopping. A few hours and several purchases later we returned home with Samos carry out for dinner. Hello gyro salad, Unbreakable Kimmy Schmidt and snuggling with my favorite fur ball.